"Kate Winters has won immortality. But if she wants a life with Henry in the Underworld, she'll have to fight for it. Becoming immortal wasn't supposed to be the easy part. Though Kate is about to be crowned Queen of the Underworld, she's as isolated as ever. And despite her growing love for Henry, ruler of the Underworld, he's becoming ever more distant and secretive. Then, in the midst of Kate's coronation, Henry is abducted by the only being powerful enough to kill him: the King of the Titans. As the other gods prepare for a war that could end them all, it is up to Kate to save Henry from the depths of Tartarus. But in order to navigate the endless caverns of the Underworld, Kate must enlist the help of the one person who is the greatest threat to her future.Henry's first wife, Persephone." I have to start by telling you all that I actually only read The Goddess Test (and The Goddess Hunt novella) the day before I read this. I literally spent the day reading The Goddess Test, and the night reading The Goddess Hunt. I even woke up early to get a start on this, and boy was it worth it! 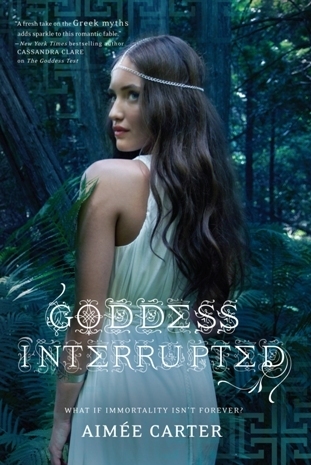 For all of you that have read and loved The Goddess Test, let me tell you that you will not be disappointed by Goddess Interrupted! The only bad thing is the KILLER cliff-hanger ending and the agonizingly long wait for The Goddess Inheritance (The Goddess Test #3, due out April 2013). Let's start with characters - Kate is fantastic. She did get on my nerves at times, but I think in her situation, I probably would have been the same way. I love how she fought for Henry, even though she was clearly conflicted the whole time. Henry, was such a typical male (no offence to all you males) in the way that he was so bottled up about his feelings, and for that he almost lost Kate. I really wanted to shake him and just say "TELL HER WHAT YOU REALLY WANT FOR GOODNESS SAKES". I think he learnt his lesson anyway. All the other Gods/Goddesses are fantastically written, even Calliope! I was worried about James and Kate for awhile, wondering where this friendship-but-James-really-being-in-love-with-her was going to go. I still curious to see where it will go in book 3. Now for the plot-line, without giving away the best bits of course. Titans making trouble? It was bound to happen at some point. This is Greek mythology after all. But it didn't feel overdone or recycled. I just loved the way Aimee wrote it. Persephone was a big new inclusion in this story - I hated her at the start, then liked her then hated her and now i'm just not quite sure. Great review, Claire! I haven't read The Goddess Test yet (I know, I know, I'm late XD), but reading your review is pretty much pushing me to read the series now.